Someone in my guestbook was looking for a shoujo series that had an uke-type of leading man. So I dug around a bit in my collection, and found this one 🙂 I know I have a few others too; I just need to find them. 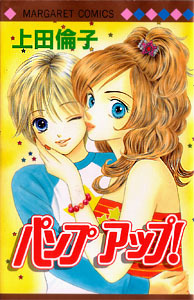 And as I was about to start writing this, I realized that this book is even being translated into English (I usually have no idea about these things) so google around ^_^ Anyway, this is a cute one-shot volume. It has two main stories that take up about half of the volume each. This book is by UEDA Rinko, who is an author I like a lot. I just realized I haven’t covered any of her other series here before! She is known for her series Tail of the Moon, and Ryou among others. In the first story, our heroine is Miharu-chan, a cute, energetic, athletic girl. It is the beginning of a new school year, but she is feeling a bit awkward because she is starting school a little late due to an illness. She feels like a transfer-student! Fortunately, there is a friendly classmate who happily greets Miharu. The classmate is extremely cute, with short hair, and a very delicate beauty. Mihari is struck by how cute this girl is! The girl shows Miharu where her seat is, and introduces herself as MORI Mizutani. Miharu is relieved to make a friend so quickly, and soon Mizutani and Miharu are bonding over shared interests. They are both very cute and excited to find someone else who likes the same things. After meeting Mizutani, Miharu is soon welcomed by other classmates, and she makes several new friends. What a relief! But then when their group is heading out of class to use the restroom, Miharu makes a shocking discovery. Mizutani is…. a boy! This is a rather silly thing to be shocked about, considering he IS wearing a boy’s uniform slacks and everything. But he is just so pretty and feminine and cute, she didn’t notice! Miharu is surprised! But that doesn’t stop their freindship from blooming. Miharu and Mizutani become very close. One day, after going shopping together, they are on the train home (and pressed rather close together…) when a groper attacks! Only it’s Mizutani who is being groped! Before Miharu can do anything to help the poor boy, they are rescued by a tall, handsome, athletic guy who also goes to their school. His name is KAWAGOE Ren, and he is repeating his first year. This is why he looks so much older and more mature to Miharu. And wow, he IS handsome. Miharu blushes when she looks at Ren. Ren is in the soccer club, and he is an ace player. Mizutani, being weak and frail, tries hard to play soccer too, but he fails. Meanwhile, Miharu also tries playing soccer and does very well. Miharu finds herself worrying over Mizutani like a mother hen, patching up his injuries and wanting to protect him. But when Mizutani suddenly declares he wants to join the soccer club, and he looks at Ren with that blushing face, she begins to realize he likes Ren too! But how can she compete, when Mizutani is better at traditional girls stuff than she is?! The second story is about a pair of reunited childhood friends. High school girl Makoto is shocked when she is suddenly hugged by a stranger one day while she is returning home from school. But wait, this isn’t a stranger. It’s Shin-chan, her childhood friend! She remembers playing with him when they were young children. He was a cute, sweet, little boy. But then his parents moved to America, taking Shin with him. But now he is back, and boy has he changed! He is tall, handsome, and charming. He speaks English fluently, and is a scholar. But he is still the sweet, cute, funny Shin-chan, and he seems to like Makoto a lot. But even though Makoto is happy to see him again, she realizes he is becoming popular with her friends. How can she compare to his greatness? Thank you so much for doing this! I was the person who asked about it, and was pleasantly surprised to find that you were able to find a series just like what I asked! I tried looking for it online like you said, and was able to find it at MangaFox. Such a cute read. Thanks again!